Sometime last week, I got invited to a tea tasting. I’ve had my fit of coffee tasting, but tea tasting is definitely something I’d love to try. Without hesitation, I said yes, even grabbing Kaoko in the process. It was an event not to miss! And all the more when you have a tea expert guiding you through the tasting! You just can’t resist the invitation! We arrived a little late. We missed some small details about tea making, but we arrived just in time to know more about the history of tea, the process of tasting and the flavors to look for. Finally, something quite applicable. 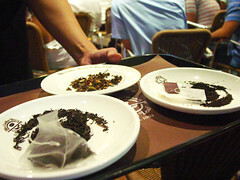 There was even a comparison of commercial teas and the teas served in Coffee Bean Tea& Leaf. There was a marked difference, for us who didn’t know, how much it’s ground and how ‘fresh’ it is from the picking. These two things truly mattered in your tea tasting. 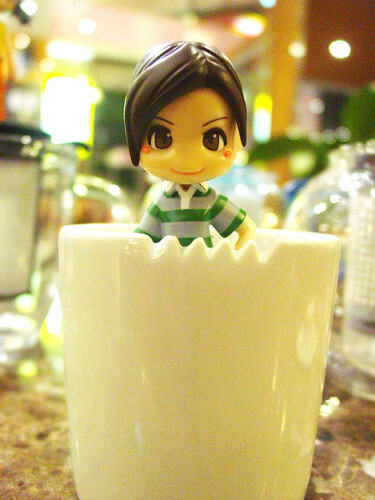 And then Coffee Bean Tea & Leaf brought out their teas by the cup. 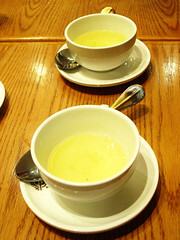 We had a shot in drinking Genmaicha Green Tea, a Japanese rice tea with a bit of sencha, Fancy Dragon Oolong Tea, which is naturally sweet compared to the oolong teas we get in Chinese restaurants, the Apricot Ceylon, a nice and lovely fruity tea that screams apricot (If you love the jam like I do, you’ll love this! ), Chai, which is usually not to my liking, until this tea came along, and lastly, the African Sunrise, a CBTL tea that will be released in Philippines sometime June. When I tasted this, the first thing that entered my head was bubble gum. Others thought it was caramel. But for me, it’s like the taste of nice and soft, freshly-made bubble gum for slurping. It was lovely. The flavors were amazing and the tasting definitely showed a great spectrum of teas. From where I sit at my kitchen table this cold winter Sunday afternoon in February I spy enough teapots and tea cups, that no matter the number who join me, there’s enough to serve each of you a hot cup of steaming tea. My shelves are filled with special keepsakes and warm memories and I view one of life’s little pleasures which can make me feel like royalty, and provides past memories of sitting at a tea table where everyone is a friend. I’m attached to my tea cups and teapots and even when I use a tea bag I’m surrounded by the reminder that it’s Tea Time and, as I sip, I realize they’re not mere material possessions, they really do lighten up my day. There’s my Grandma’s black teapot with the distinctive floral design, there’s the light green ornate teapot that holds a candle because the lid is missing, the dainty floral Marjolien Bastin teapot, the many fragile teapots that hold memories of each friend or family member who gave it to me. Packed away for special occasions are the Christmas teapots and tea cups and a recent thrift store find, the Heart decorated teapot and matching cups for Valentine’s Day. Some teapots are more useable, some are fat and chunky, some have matching cups, but all have a personality of their own. Come sit down for a spell and pick up your choice of a personalized tea cup. Will it be a Red Hat cup, a cup from Wales, U.K. with the Welsh dragon on it, the Precious Moments cup, one of many Bone China tea cups, one of the Tea for One sets with your own matching teapot, or perhaps the fragile china tea cup my friend gave me to remember her by before she died? If you like, choose one of the cobalt blue cups sitting on the kitchen window sill which catch the sunlight in colorful prisms. There are too many to count, and more than a few have arrived from yard sales, the Good Will and local thrift stores. A serving tray holds the miniature white cups purchased in Germany and I pause for a moment to remember that after bringing them carefully with me on the plane, I then left them behind in the overhead luggage bin. Wonder of wonders, I called the airline when I arrived home and they had been found and were already being held at the check-in desk and were safely back in my hands after making a return airport trip to pick them up. Fill the teapots with your choice of tea………will it be Stash, Bentley, Twinings, Lipton’s, Tasha Tudor’s special blend, or Chami’s Rooibos or Chai? Hot or iced Tea? Whichever it is, let it steep, cover it with the Tea Cozy and enjoy the Victorian Lady ceramic Tea Party centerpiece playing music while water trickles down the fountain behind the tea table. Emily Barnes’ books, The Twelve Teas of Christmas, The Twelve Teas of Celebration, The Twelve Teas of Friendship, and Everything I Know I Learned Over Tea, line the shelf together with Camille Ellerbrook’s You’re Just My Cup of Tea. Today when larger Mugs seem to have become more common, a cuppa tea with God in the morning and at nightime, and then enjoyed with good friends and family in between, is a celebration of JOY.! Oh! I almost forgot, will you have it with cream or sugar?